When it’s time to eat, Filipinos are known to drop what they are doing to savor a nice sit-down meal with good food and good company. Meal times become everyday special occasions that people look forward to so they can refuel or reward themselves for the day’s work. Filipinos would like to eat well all the time; if only great-tasting food was always easy on the budget. Fortunately, a new rice meal from McDonald’s answers this call for a delicious, complete, and filling meal at an affordable price. 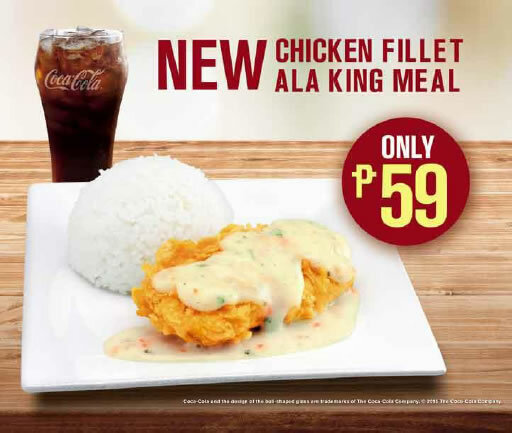 Introducing McDonald’s new Chicken Fillet ala King meal for only P59! It is made with crispy and juicy chicken fillet, topped with delectable, creamy and buttery sauce with carrot bits and chives; complete with rice and a drink. The Chicken Fillet ala King is a sure-hit for Filipino customers’ taste buds and budget. It will be available at McDonald’s restaurants nationwide starting September 7. Aside from the Chicken Fillet ala King, there are more chicken favorites to choose from at McDonald’s. Customers can also enjoy McDonald’s best tasting Chicken McDo meal (Php79), Crispy Chicken Fillet meal with Fries (Php79), Chicken McDo meal with Fries (Php99) and Chicken McDo with McSpaghetti (Php99). Who says eating like a king has to cost a fortune? Experience delicious, filling and above all, affordable meals at McDonald’s via Dine-In, Drive-Thru, or McDelivery through 86-2-36, mcdelivery.com.ph or the McDo PH App. Share your McDo moments with McDonald’s Philippines through the official Facebook page: http://facebook.com/mcdo.ph or by tagging @McDo_PH on Twitter and Instagram. September 30 is KFC Delivery Fans Day!!!! Burger King: Grill and Chill Cookout! It's Monday Payback time at Shakey's!